The Z Series is our most compact and economical regulator system. But its rare combination of performance, ergonomics and materials is unmatched by competitors at any price. 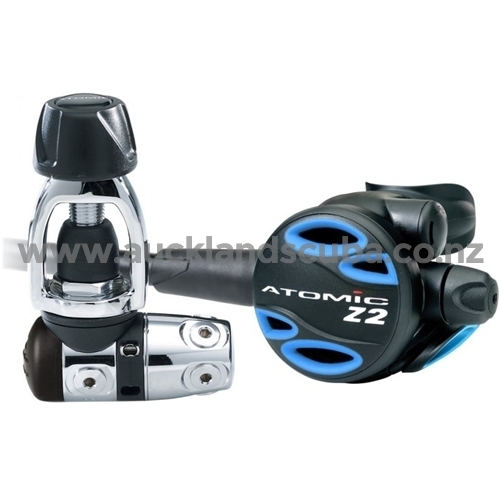 The Z Series gives divers the assurance of the same Limited Lifetime Warranty as all Atomic regulators. The Z2 first stage is made from chrome plated brass with type 316 stainless steel. The second stage features a precision machined brass demand valve tube, plated with Palladium/ Zirconium for corrosion resistance 3-4 times that of conventional chrome plating. The lever, orifice and second stage spring are titanium. Exclusive Atomic feature prolongs the second stage seat life indefinitely, eliminating aggravating leaks and degradations in performance. Automatic flow control, Exclusive Atomic feature automatically adjusts airflow at depth to maintain stable, comfortable breathing. High performance (low inhalation efforts at deep depths and high breathing rates) yet delivers the air naturally and comfortably. Single piece computer machined body maintains perfect alignment of the piston and seat to eliminate creeping intermediate pressure problems.